WINTHROP -- Last summer, when the short woman with scraggly hair and despondent eyes approached him, the pastor did more than promise help – he let the newly homeless woman sleep in the choir’s loft of his church. Nearly a year later, the 52-year-old former nurse remains at the Holy Rosary Parish in Winthrop, where she often wakes on fetid cushions to the 9 a.m. Mass, her possessions – old mail, New Balance sneakers, a tube of Crest – surrounding the old, broken organ. Her presence has raised an awkward issue for parishioners at Holy Rosary and other churches: Is the church a pristine, peaceful, non-threatening place to pray; or should it sacrifice some of its cherished quiet to be a sanctuary for the neediest? Some parishioners are fed up by what they see as her disturbing their peace, and they want her out. Others have tried to help without success, bringing her food, trying to rent her an apartment, offering her medical attention, nearly all of which she's refused. Still others sympathize with her and think she should be allowed to stay as long as she wants, and that the church should be a refuge. 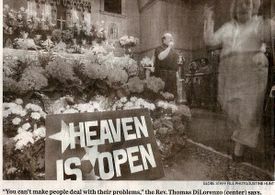 For all his efforts, Father Thomas DiLorenzo has reached his limit. Marie Matarazzo, a life-long resident of this small, harbor-side town, must be out soon, he said. "I invited her to stay, because she had no place else to live," DiLorenzo said. "I wasn’t going to put her out. She was having a difficult time. But sometimes you can only give people help when they want it. She doesn’t want help, and wouldn’t take it. You can’t make people deal with their problems." He added: "Now, she has to make a decision. I’m not going to keep her another year." Parishioners are divided and many have asked: What should you do when you try to help someone, and they won’t accept the help? "It’s difficult – this is a situation for which I just don’t have a simple answer," said Patricia McGee, a life-long parishioner who has served as the church’s cantor for the past 30 years. "No one seems to know the right thing to do." One woman who belongs to the church and declined to have her name printed said she thinks it’s wrong for a church to substitute for a homeless shelter. "People are disgusted," the woman said. "She’s a disturbance ... and she makes a ruckus. This is something outside the realm of what a church should allow. I know people who have left the church because of this." Another long-time parishioner, Mary Rice has allowed Matarazzo to shower at her home. "She's a beautiful girl, smart, and lovely," she said. "We’re trying to do the will of God." A spokesman from the Archdiocese of Boston said officials there don’t encourage similar policies in other churches, but they understand there’s a fine line parishioners and priests must draw between their comfort and the church’s mission to help the poor. "Although this is not an ideal situation – we wouldn’t encourage people sleeping in churches – we understand and respect that the father’s heart is in the right place," said Terry Donilon, the spokesman. "That’s what the church is about – helping people in need." Matarazzo also has burdened her family, putting her three brothers through fruitless efforts to end her homelessness, they said. Like the church, for the most part, they have given up. Before last summer, Matarazzo lived in a two-family brick home here on Shirley Street. Last year, five years after the death of her father, her brothers decided to follow their father’s dying wishes – which he put in his will, they said –and sell the house and divide the proceeds. They hope to earn the more than a half-million dollars. Her brother, Jim Matarazzo, who sees his sister regularly and collects her mail, said he helped subsidize her sister’s living at the family's home over the past several years, because the never-married former nurse hadn’t worked for more than a decade. But when they suggested she move, she refused. It took six court hearings, a constable, and police officers to remove her from the home, he said, where she had horded hundreds of empty Special K boxes, 27,000 pennies, $240 worth of empty cans, and 14 cats, among other things. "I found a nice apartment near the shelter where she had the cats, and I offered to pay a year in advance," said her brother, adding it took a year to clean up the house before putting it up for sale. "But she raised a lot of problems with the landlord, and they refused to rent to her." Her family and others have since made repeated efforts to find her a new home, but he said: "It’s always ... too this or too that, and she finds a way for it not to work." They’ve also tried to get her medical help. His brothers, he said, once had her taken to a mental health facility in Lynn, but because officials couldn’t keep her there against her will, she left. Matarazzo appreciates the church’s efforts, he said, but he thinks she won’t move on until she decides it’s time. "She’s choosing to be homeless," he said, adding she has tens of thousands of dollars saved and could, if she found a job, secure a mortgage to buy the family’s house. "I will absolutely not help her anymore." For her part, Marie Matarazzo still hasn’t adapted to her new circumstances. After a recent morning sitting in the pews listening to a homily about the value of prayer, the woman with mussed brown hair, wearing a fleece covered in cat fur and a vacant stare, pined for her old home. "I miss it," she said in a soft, plaintive, lucid voice. "It’s the home where I grew up, where I was born. I lived there all my life. My brothers knew I couldn’t go anywhere from there. I talk to (my brother) Jimmy every day. I say I want to go home, and he says, ‘Dad wanted us to sell the home.’ I don’t believe that was what my father wanted." She said she appreciates all the church’s help, but she doesn’t know where to go at the end of the month. Asked why she won’t accept help, she paused and then said: "I don’t know. I don’t know. I really don’t know."